Giant hogweed (Heracleum mantegazzianum) is a noxious plant that’s been making its way into the headlines lately—especially in New York. This short-lived herbaceous perennial can grow 15 feet tall or more and form large patches. 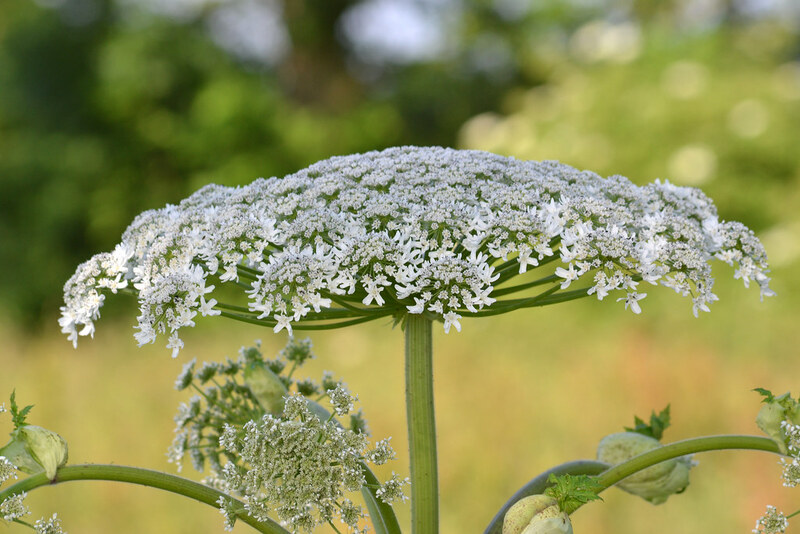 Its blooms are enormous umbels made up of thousands of white to pinkish flowers—think parasol-size Queen Anne’s lace. It’s an impressive-looking plant, but beware of the painful and potentially life-changing consequences of touching it! Native to Eurasia, giant hogweed was introduced in North America in the early 20th century as an ornamental garden plant but soon slipped its bounds and is now considered invasive in parts of the U.S. and Canada, including the Northeast. It’s also on the USDA’s Federal Noxious Weeds list for one especially nasty characteristic—its sap can be extremely dangerous if it touches bare skin or the eye and is then exposed to sunlight. In addition to its large, eye-catching flowers, the plant has gigantic, deeply incised serrated leaves and thick, purple-blotched green stems. 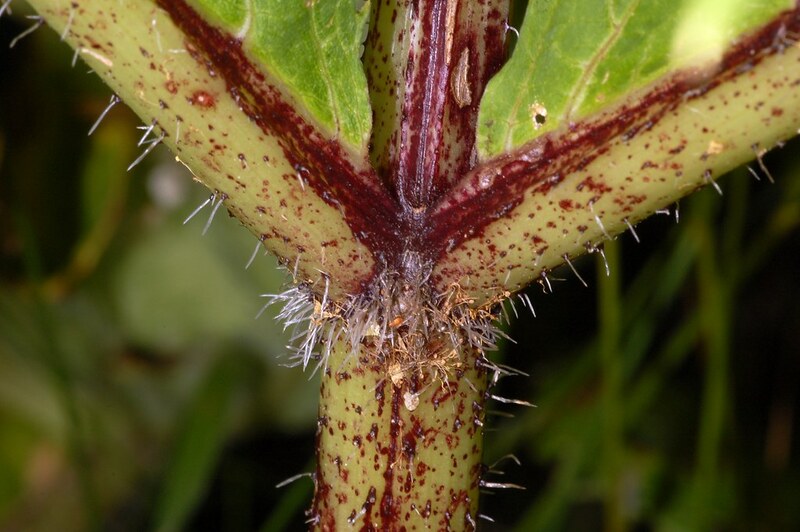 The stems and undersides of the leaves are covered in fine hairs that upon contact release sap that can cause phytophotodermatitis (phyto meaning "plant," photo meaning "light," dermatitis meaning "skin inflammation"). Within as little as 15 minutes of sunlight’s hitting the exposed area, the skin begins reacting, developing painful sunburn-like blisters, peeling skin, and long-term sensitivity to sunlight. If the sap gets in the eyes, it is potentially blinding. The blisters and peeling may last several weeks, and some people develop scarring and extreme sensitivity to sunlight for years afterward. Many other members of the Apiaceae, or carrot family, also contain compounds called coumarins (specifically furanocoumarins) that are photosensitizing: In combination with ultraviolet light, they interfere with the DNA of exposed skin cells, causing various degrees of inflammation. Limited exposure to these compounds in the most well-known members of this family—like parsnips, celery, and parsley—has little or no effect on most people. Interestingly, these same compounds (which are also found in citrus) are used therapeutically for vitiligo, psoriasis, and other skin ailments. Giant hogweed is another story. In case of a run-in with the plant, the first thing to do is cover up the affected area of skin. Sunlight (even on a cloudy day) will set off the chemical action of the sap. Wash the area with cold water and soap and apply sunscreen to block as much ultraviolet light as possible if you’re stuck outdoors. Protect exposed skin from all sunlight for at least two days. If burns or blisters develop, a topical steroid may alleviate discomfort. If you think sap has touched your eyes, wash them out with water, put on sunglasses, and call your doctor. Fortunately for Brooklynites, in a survey conducted by Brooklyn Botanic Garden’s New York Metropolitan Flora Project (NYMF), only a few patches have been discovered within 50 miles of the city. Still, giant hogweed has made inroads in the Adirondacks and other parts of north and western New York where people might come into contact with it during camping, canoeing, or hiking. Its presence has alarmed rural residents, and in August, Senator Chuck Schumer called for the USDA to boost eradication efforts. The best way to avoid exposure to giant hogweed is to learn to recognize it and give it a wide berth. 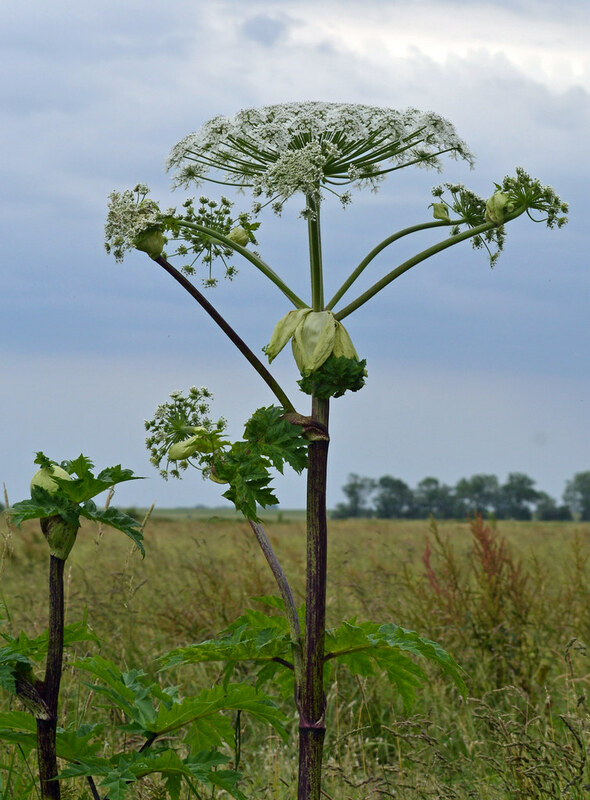 The New York State Department of Environmental Conservation (NYDEC) has a couple of good fact sheets about giant hogweed, with information on where it might be encountered and how to distinguish it from look-alike relations like cow parsley, angelica, and poison hemlock. The plant starts life as a low rosette of green leaves that vary in appearance. After a year or more of foliage growth, a stalk forms, producing one or more stunning, flat-topped flower heads. After the plant sets seed, it dies. But it doesn’t end there: Each inflorescence can produce as many as 20,000 seeds, which remain viable for years and can grow in many types of conditions, particularly in moist soils with full sun, like ditches and damp meadows. More: Learn how to spot poison ivy. Once established, the plant’s taproot helps it withstand drought, herbivory, and even fire. In some places where it has gained a foothold, huge patches of earth are covered with little else than giant hogweed. Even a single plant can cause harm to anyone who might inadvertently come into contact with it. If you encounter giant hogweed on public lands, contact the state or provincial park authority. If you personally must deal with a plant, take strong measures to protect yourself before tackling it. 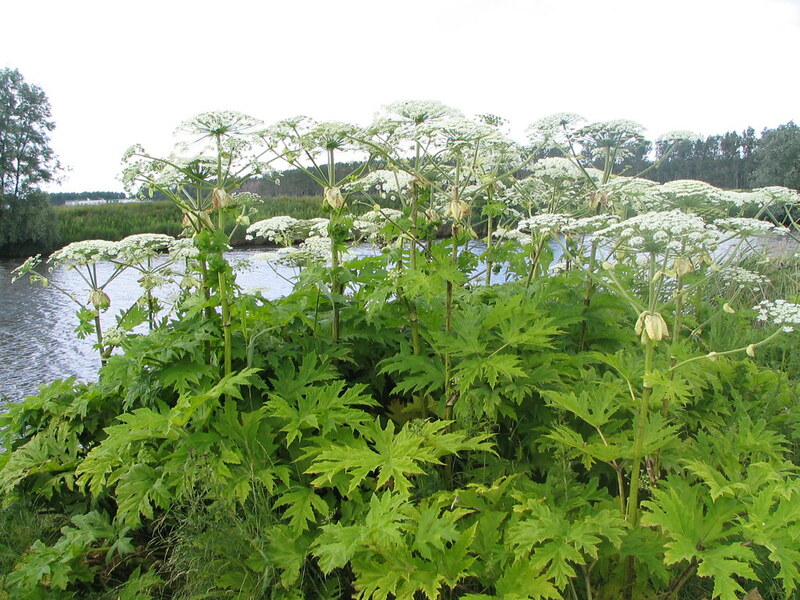 The NYDEC’s Giant Hogweed Control Methods Guide is particularly worth reading beforehand. Apply sunblock to your face, neck, hands, arms, ankles, and anywhere else that could come into contact with the plant. Wear long sleeves and pants, socks, heavy shoes or rubber boots, and rubber gloves. Have all your tools and plastic trash bags at the ready. The best method for eliminating the plant is to cut its taproot. If the plant is actively growing, first carefully trim off any flower or seed heads to keep the seeds from dropping. Use long-handled loppers to take down the herbaceous portions of the plant and put them in trash bags for disposal. Dig down and slice through the taproot; this may not kill it outright, but if you repeatedly cut back any new growth, the plant will eventually weaken and die. Never attempt to take down giant hogweed with a weed trimmer; any bits of plant matter on your clothes can expose you to the sap later. Ultimately, giant hogweed is nowhere near as pervasive in the American landscape as poison ivy, stinging nettle, or even poison oak. Still, patches are being reported in more wild areas every year in the U.S., and some unwitting admirers still grow it in gardens for its gorgeous flowers. Becoming familiar with this weed could be your best protection! Giant hogweed likes moist soil and full sun. It often establishes itself along bodies of water and ditches, as well as in damp meadows. Photo by GerardM. The stems of giant hogweed are covered with needlelike hairs. Touching these will cause the plant to release irritating sap that may result in painful blisters. Photo by Fritz Geller-Grimm. Giant hogweed, particularly the flower head, resembles Queen Anne’s lace and other carrot family members. Photo by Huhu Uet. Heracleum mantegazzianum (giant hogweed) is a lovely but noxious perennial that can grow up to 15 feet high. Photo by Huhu Uet.